Orbus 10'' Coyote Pop Up Trade Show Displays by New World Case Inc. 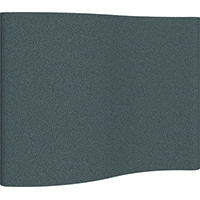 This premium portable Trade Show Pop Up Display comes in your choice of 12 Premier Fabric colors, or finished with high quality printed graphic mural panels created from your media files. 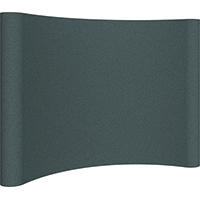 Add Lighting, shelves, monitors, and coordinating Case-to Counter wraps to customize this durable display to your needs. Lifetime Warranty on all hardware. 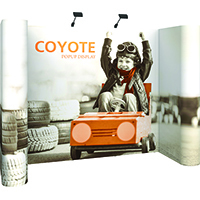 Orbus 10' Coyote Pop Up Display will give you a seamless backdrop to highlight your corporate message! Curved and Straight frames available! The Orbus 10' Coyote Full Mural Pop Up Display offers a full printed curved backdrop that features your corporate image and messages! 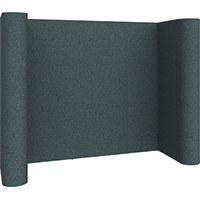 Straight Frame Coyote displays also available! The Coyote 10' Serpentine Fabric Pop Up Display provides a wave-shaped backdrop covered in plush Premier fabric to highlight your corporate look! Oval shipping case included! 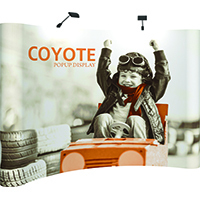 This Coyote pop up Trade Show Display provides a 10' wide s-curved back wall covered in your company's graphic images and message! 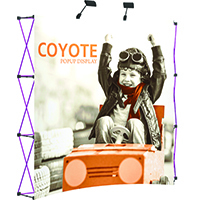 The Coyote 10' Horseshoe Pop Up Display offers a partially enclosed booth layout to distinguish you from your neighbors at your show. Shipping Cases are included! 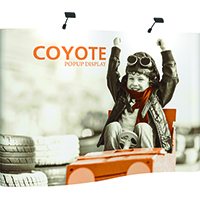 The Coyote 10' Horseshoe Pop Up Full Mural Display offers High quality Printed Graphic Mural Panels that create a bright visual selling area for your company.